When the 1st MAW at MCAS El Toro was requested to provide a photo reconnaissance detachment for the USS Valley Forge’s (CV-45) deployment to WESTPAC in Spring of 1950 it likely looked like a win-win situation, the Navy would get help and it would provide valuable training for the Marine F4U-5P aircrews and photo technicians on the Navy’s O &M budget. 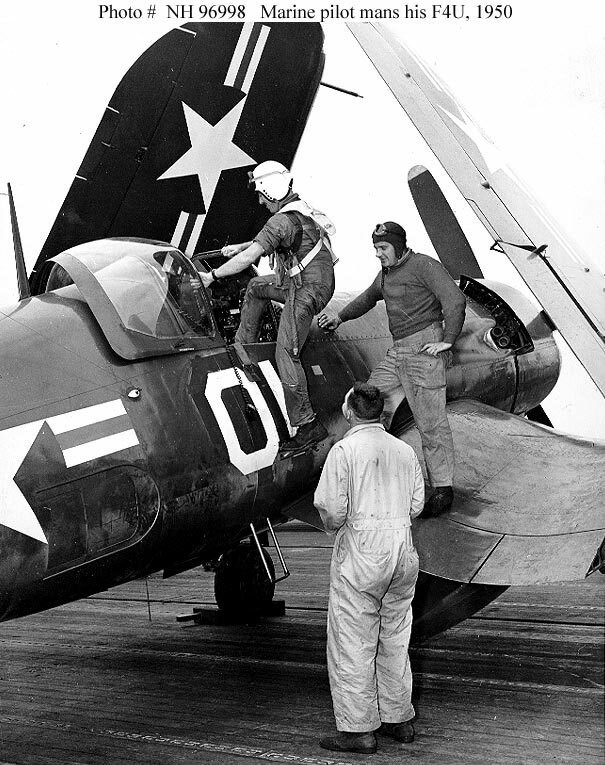 With the FMF only a shell of its WW II posture, the last photo squadron in 1st MAW, VMP-254, had been decommissioned in December, 1949 and its F7F-3P Tiger Cats and Corsairs had been transferred to HEDRON-1 as a Photo Reconnaissance section. So, a five plane Corsair det was committed to CAG-5 for a peace time cruise aboard the “Happy Valley” as the USS Valley Forge was called by her crew. Capt. Jesse “Davy” Booker was named the OIC for the Marine Det and a good choice since he had a combat tour in WW II flying Corsairs with VMF-218 and then served in China with VMO-3 in 1946. His Navy counterparts would later describe him as a ‘hard as nails” Marine. So, his photo det sailed with CAG-5 which included two Panther jet fighter squadrons, two Corsair fighter/attack squadrons and a AD Skyraider attack squadron along with his five photo Corsairs. Once in the Pacific, the ship would be based out of Okinawa and become the lead ship in TF-77 as it was the only aircraft carrier in WESTPAC under Seventh Fleet. On 25 June, 1950 the ship was in port in Hong Kong for a leisurely visit. That would quickly change as news came that the North Koreans had invaded South Korea. Returning immediately to Okinawa, TF-77 was held in reserve for a few days as there were fears that the Chinese communists would attack Taiwan as part of a coordinated offensive. When that did not materialize and the meager 5th AF assets in Japan already committed to supporting the evacuation of civilians and the out-manned ROK Army, TF-77 was ordered to move to the Yellow Sea and launch strikes against the NK airfields around Pyongyang. The first day of combat for the U.S. Navy and Marine Corps would be 3 July, 1950. CAG-5 carried out a full blown strike led by the Panthers who logged the first two Navy kills of the war by downing two NKAF Yak-9s, with the Corsairs and ADs heavily damaging the airfields and near by rail yards. The follow-up BDA mission fell to the Marine photo det and it would be the first combat mission by the Marine Corps as well. Capt. Booker was the section lead for this mission escorted by a VF-53 Corsair flown by Lt. (j.g.) Darrow. They had discussed the threat of being bounced by fighters during their post-strike mission and Darrow was all eyes as they began the photo run. Good thing as a he spotted a Yak rolling in behind them. He called to alert Booker who had his head down setting up for the photos but got no response due to an untimely radio failure. Darrow broke into the Yak who was in position to fire but did not for some reason, diverting him away momentarily and then joined on his section lead, finally getting his attention. Good news is both aircraft escaped unharmed and trapped back aboard Happy Valley with their film. The U.S. Navy and Marine Corps had successfully completed their first combat missions of the “forgotten” war. I went in for a photo run to try to determine where the stress members of the bridge were located. Talk about doing dumb things, I made 3 passes -under the bridge- lifting the wing each time to let the oblique cameras shoot the supporting members. The trouble was on my third pass they were waiting for me. I was hit with something big which tore off half my right wing and the oil cooler system. I couldn’t climb but managed to keep it flying down the river bed for about a minute and a half until the engine froze and I had to put it in. Captured immediately, he was dragged through a village where he was spat on and put in a cage labeled “Capitalist Warmonger” and beat so savagely he was partially paralyzed. He was mentioned later on Seoul City Sue’s propaganda radio show but no further word of his fate was known until much later when his wife, daughter of a Marine general, spotted him in a photo of American POWs. After the Inchon landing, he was taken North, thrown into a ditch with over 100 other POWs who were then machine-gunned with only 19 surviving to go into the “death camps”. Captain Booker was among the last of the POWs released in September, 1953 making him the longest surviving Marine Corps POW. Jesse Booker remained in the Marine Corps after his release as a POW in Sept, 1953 and became CO of VMF (AW) 235 from April,1962 until February, 1964.